“The Truth About Lipstick.” The Scarlet Sound, August 2011. “Baby Broker.” Blink-Ink Magazine, April 2012. “Start to Stop.” The Rusty Nail Magazine, July 2012. "Your Wedding Pictures." Freight Train Magazine, January 2013. "Stuck." Zest Literary Journal, October 2013. "Burial." Lotus-Eater Literary Magazine, Fall 2014. New fiction in The Best of There Will Be Words 2014 Chapbook, May 2015. "In the Dark." Ghost Parachute Literary Magazine, January 2017. "Saved." Ghost Parachute Literary Magazine, August 2017. "The Heart is a Strong Muscle." Thrill of the Hunt Anthology (Palmas Press, 2017). "Funeral Arrangements." Ghost Parachute Literary Magazine, February 2018. "Five Ways of Looking at a Black Woman," BSU's The Voice Magazine. "for Stepha." Moko Caribbean Arts & Letters, July 2016. Winner in the Writer Unboxed Summer Flash Fiction Contest (2012) for "Second Chances." "The Importance of Self-Love." La Mensajera, Fall 2013. "Eating Healthy on a Budget." La Mensajera, Spring 2014. "What It's Really Like Owning a Writing Center." The Drunken Odyssey with John King, August 2015. "On Writer's Atelier." UCF Creative Writing MFA Blog, February 2016. "March 15, 2017." Past Ten, March2017. Untitled piece. Reaching Beyond the Saguaros: A Collaborative Prosimetric Travelogue(Serving House Books, 2017). "When to Stay." 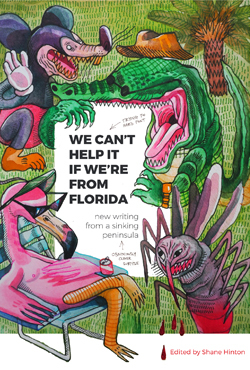 We Can't Help it if We're From Florida (Burrow Press 2017). "What Is Flash Fiction? 7 Ways to Craft A Quality Flash Fiction Story"
"7 Things An Author Website Should Have"
An Interview with Jenny Torres Sanchez, Fantastic Floridas, January 2017.